Bowden Looks for Second Win over 200-Win Coach Has any head coach in Division I history defeated two coaches with 200 wins in the same year? How about the same month? That is the opportunity Clemson head coach Tommy Bowden has this week when the Tigers take on Lou Holtz and the South Carolina Gamecocks. 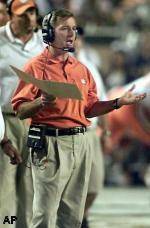 On November 8, Tommy Bowden defeated his father, Bobby Bowden of Florida State, by a 26-10 score. Bobby is the winningest coach in Division I history with 341 victories. Holtz is now eighth on the list with 243 entering Saturday’s game with Clemson. Tigers Look to Finish Strong A victory for Clemson at South Carolina on Saturday would give the Tigers three straight victories to close the regular season. Clemson has not closed the regular season with three straight wins since the 1995 season when the Tigers won their last five games, including a 38-17 victory at South Carolina. Clemson has a 21-8-2 record against South Carolina when it enters the rivalry game with at least a two-game winning streak. Clemson has lost just twice in that situation since 1987. Ironically, the only South Carolina coach to defeat Clemson when it enters the South Carolina game on a two-game winning streak is current Clemson offensive coordinator Brad Scott. Clemson entered the 1994 game on a three-game winning streak, but fell to Scott’s Gamecocks 33-7 in Death Valley. In 1996 Clemson entered the South Carolina game on a five-game winning streak, but Scott and the Gamecocks won that game 34-31 at Death Valley. Clemson has a 12-4-1 record against South Carolina when the Tigers enter the game with at least seven wins. The only time since 1987 that Clemson has had seven wins entering the South Carolina game, then lost to the Gamecocks was in 1996 when a 7-3 Clemson team lost at home to South Carolina, 34-31. Clemson Areas of Improvement in 2003 Clemson has been an improved football team in just about every area in 2003. That is shown in overall record (7-6 to 7-4), ranking in the ACC standings (fifth to third), and various offensive, defensive and special teams categories. Clemson has improved its total offense from 363.5 to 411.5 yards per game and its total defense from 355.4 to 329.9 yards per game. Clemson has improved by six yards per punt in terms of net punting, increased average starting position on defense from the 29 to the 24-yard-line, and its scoring margin from -1.46 to +5.1 points per game. Clemson National Team of the Week by Football Writers Association When Clemson defeated Florida State on November 8 it was named the National Team of the Week by the Football Writers Association of America. Clemson stopped third ranked Florida State by a 26-10 score. It was the highest ranked team Clemson has defeated in history. It was the first time Clemson has been named National Team of the Week by that organization. Tigers from South Carolina Clemson has 37 players on its active roster who should travel to Columbia for the South Carolina game. An additional 10 players are walk-on natives of the state who probably won’t dress for the game. The list of Tigers from South Carolina includes four players from Columbia, Airese Currie, Toure Francis, Todd McClinton and Steven Jackson. Eight Tigers from the state started against Duke, Tony Elliott (WR), Mo Fountain (DE), Derrick Hamilton (WR), William Henry (OT), Tye Hill (CB), Travis Pugh (FS), Gregory Walker (OT), Donnell Washington (DT). Throw out the Record Books? We always here the phrase, “You can throw out he record books when these two teams get together.” While there have been some upsets in this series, usually the team with the better record comes away with the victory. The team entering the game with the better overall record has a 16-2-1 record in the series since 1981. That computes to 86.8 percent over a 22-year period. Three times during that era both teams had the same record. The team with the better record entering this game has won every year since and including 1997. The last time that did not happen was 1996 when Clemson was 7-3 and South Carolina was 5-5 and the Gamecocks won at Clemson, 34-31. Current Clemson offensive coordinator and assistant head coach Brad Scott was the head coach for South Carolina in that game. For the history of the series, Clemson has a 38-14-3 record when it enters the contest with the better record, a 72 winning percentage. Clemson has had the better record in 55 of the 100 previous meetings. The teams have had the same winning percentage entering the game nine times and Clemson has a 7-2 record in those situations. Thus, Clemson is 45-16-3 (.727) against South Carolina over the years when the Tigers enter the game with at least the same record as South Carolina. Clemson is 7-4 and South Carolina 5-6 entering this year’s contest. Clemson vs. South Carolina on ESPN This will be the fifth time in the last seven years that the Clemson vs. South Carolina game will be shown on an ESPN network. The 1996, 1997, 1998 and 2002 contests were all on ESPN 2. The 1987 and 1989 games in Columbia were shown on ESPN. This year’s game returns to ESPN-2. Clemson holds a 4-2 lead in games shown live on ESPN in the series. Clemson won the 1989, 1997, 1998 and 2002 contests, while South Carolina won in 1987 and 1996. Clemson has won just seven night games since 1995, but three of the seven wins are over South Carolina. Those are the 1997 (47-21 in Columbia), 1998 (28-19 in Clemson) and last year. Clemson has already won two games at night this season (2-1), the win at Georgia Tech and the Florida State victory on November 8. The first game of the series that was televised was the 1977 game, a 31-27 Clemson victory that was shown on a regional basis by ABC. Top 10 Unusual Facts about the Clemson vs. South Carolina Series 10. Both coaches who have won bowl games for South Carolina will be on the field Saturday on opposing sidelines. Brad Scott was the first South Carolina head coach to win a bowl game when he took the Gamecocks to victory in the 1994 Carquest Bowl over West Virginia. Current South Carolina head coach Lou Holtz has taken South Carolina to bowl victories in 2000 and 2001, both times against Ohio State. 9. The visiting team won seven consecutive years in games played between 1991-97. 8. Josh Cody had a 4-0 record for Clemson against South Carolina between 1927-30. He is the only coach in the series to have a perfect record, given a minimum of three games coached. 7. Paul Williams is the last player to letter for both schools. He lettered for Clemson in 1978 and for South Carolina in 1980. 6. A Clemson captain actually played for South Carolina. Cary Cox lettered for the Gamecocks in 1943. After the war, he enrolled at Clemson and served as captain for the Tigers in 1947. 5. Since 1989, seven different coaches have served both schools. The list includes current Clemson offensive coordinator Brad Scott, Tommy West (now head coach at Memphis) , Miles Aldridge David Bibee, Rich Bisaccia (now an assistant coach with the Tampa Bay Bucs), Woody McCorvey and Chuck Reedy. 4. In 1948 and 1981 a blocked punt returned for a touchdown proved to be the pivotal play in a Clemson victory, victories that allowed Clemson to go on to an undefeated season. In both instances, the original line of scrimmage was the South Carolina 28-yard-line. 3. Willie Underwood had two interceptions to lead Clemson to victory over South Carolina in 1980. A starter for four years, the strong safety never had recorded an interception in any of his first 46 games as a Tiger, then had two against the Gamecocks in his 47th and final game. 2. In a placekicking career that spanned five years, Bob Paulling made 107 of 109 extra points. Both of his misses were at South Carolina, one in 1981 and one in 1983. He had a streak of 70 consecutive made extra points (second longest in Clemson history) in between the two miscues. 1. In the 30 games that Frank Howard coached at Clemson against South Carolina, Clemson scored 411 points and South Carolina scored 411 points. Memorable Clemson Plays in the Series with South Carolina 1948 –Phil Prince blocked punt and Oscar Thompson returned the ball for a touchdown that gave Clemson 13-7 win in Columbia and allowed Clemson to keep an undefeated season. Play took place with 4:15 left in the game. 1959–Harvey White connected with future Super Bowl Champion Bill Mathis for a 26-yard touchdown pass in the third period to put Clemson up 19-0 in the final Big Thursday game in Columbia. White completed 9-10 passes on the day and led the Tigers to the 27-0 victory. 1962–Don Chuy and Billy Weaver combined to sack Dan Reeves for a 13-yard loss with just 33 seconds left, preserving Clemson’s 20-17 victory. South Carolina had driven to the Clemson 25 for that last play. 1966–Harry Olszewski, an All-America offensive guard, picked off a fumbled snap in mid-air and ran 12-yards for a touchdown. The 35-10 victory allowed Clemson to win the ACC title. No Clemson offensive lineman has scored a touchdown since. 1967–Buddy Gore’s 43-yard run in the third period that led to a Tiger touchdown was a momentum swaying play in Clemson’s victory over the Gamecocks, a win that allowed Clemson to clinch a tie for the ACC championship. That was the key run on this day that saw Gore become the first Clemson back in history to go over 1000 yards in a season and break Brian Piccolo’s ACC single season rushing record. 1971–Eddie Seigler kicked a 52-yard field goal to lead Clemson to a 17-7 win over the Gamecocks. It was the first field goal of at least 50 yards in Clemson history. 1972–With Clemson leading 7-6 in the fourth period, Jimmy Williamson batted down a Dobby Grossman two-point conversion pass to preserve the victory for the Tigers. 1977–Jerry Butler made a 20-yard catch of a Steve Fuller pass with 49 seconds left to give Clemson 31-27 win in Columbia. It clinched Gator Bowl bid for the Tigers, Clemson’s first bowl bid in 18 years. It was a backwards diving reception. 1980–Willie Underwood had a 37-yard interception return for a touchdown that clinched Clemson’s upset of South Carolina in 1980. Underwood was named Sports Illustrated Player of the Week for his performance in that game. 1981–Just as it had happed 33 years previously, a blocked punt played a big part in a Clemson victory over South Carolina that allowed the Tigers to have an undefeated season. Rod McSwain blocked a South Carolina punt and Johnny Rembert recovered in the endzone for the touchdown. Just as it had been 33 years previous, the line of scrimmage was the South Carolina 28. 1990–Chris Gardocki made his final punt in Death Valley memorable when he had a 78-yard boot in the fourth quarter to give South Carolina bad field position and clinch Clemson’s 24-15 victory over the Gamecocks. It remains the second longest punt in Clemson history. 1995–Emory Smith carried South Carolina tacklers 20 yards on the way to a 54-yard run that led to the game clinching touchdown in Columbia. Smith ended the game with 101 yards rushing. 1999–Rod Gardner’s 29-yard scoring catch on a fourth-down play from Woody Dantzler clinched Clemson’s 31-20 victory in Columbia. 2000–Rod Gardner’s 50-yard reception from Dantzler with 10 seconds left led to Aaron Hunt’s game winning field goal with three seconds left. The 101st Meeting This will be meeting 101 between Clemson and South Carolina. The series dates to 1896 and the first year of football at Clemson, the fourth season for South Carolina. Clemson holds the advantage 60-36-4 since that first meeting in Columbia. Clemson has more wins over South Carolina than any other school and those victories represent over 10 percent of Clemson’s all-time total (592-408-45). Clemson won the 100th meeting last year at Clemson by a 27-20 score. The Gamecocks won the last meeting in Columbia by a 20-15 score in 2001. That Gamecock victory ended a four-game winning streak for the Tigers, who have now won five of the last six. South Carolina has not beaten Clemson in consecutive years since the 1968-70 era. The Clemson vs. South Carolina series ranks in a tie for 14th in college football history in terms of most played rivalries. The most played rivalry is the Minnesota vs. Wisconsin series, which is now at 113 since the two teams played last week. The Clemson and South Carolina series will tie the Kansas vs. Kansas State series when the two teams meet Saturday night. This will be the 95th consecutive year that Clemson and South Carolina have met on the gridiron, every year since 1909. It ranks as the fourth longest uninterrupted rivalry in college football history, third among active rivalries. The only active rivalries that are longer are the Kansas vs. Nebraska rivalry (active since 1906) and the Minnesota vs. Wisconsin rivalry (active since 1907). The Kansas vs. Oklahoma rivalry ran 96 consecutive games before it was interrupted after the 1997 game. Elliott Named to CoSida Academic All-District Team Clemson graduate student Tony Elliott has been named to the CoSida Academic District III team. Elliott is now a candidate for Academic All-America honors. That team will be announced on December 1.Elliott is the first Clemson player named to the team since Chad Carson and Kyle Young both made the team from 1999-01. Both made first-team Academic All-American that year. Elliott received his undergraduate degree in engineering last May. The Charleston, SC native earned a 3.55 GPA for his career. He is now in graduate school taking courses in international trade. So far this year Elliott has 22 receptions for 261 yards and a touchdown. He is a major reason Clemson has averaged 285 yards per game, a school record pace. He is fourth among Clemson’s wide receivers in receptions and yardage this season. He has had at least one reception in eight of the 11 games this year, including a season high five catches for 31 yards and a touchdown at Georgia Tech. Elliott has overcome much hardship in his life. He suffered multiple fractures when he was injured in an auto accident as a youth. His mother died in an auto accident he witnessed as a youth and he has raised his younger sister, who is presently a University of South Carolina student. Miller Joins Gage in Record Books Clemson sophomore defensive back and return specialist Justin Miller returned a punt 63 yards for a touchdown in the win over Duke on November 15. That was his first punt return for a touchdown in his career. Last year Miller had an 80-yard kickoff return for a touchdown against NC State on his first career kick return of any kind. With his return against Duke, Miller became the second player in Clemson history to have a punt return and a kickoff return for a touchdown in a career. Bobby Gage, an All-American for Clemson in 1948, had an 89-yard kickoff return for a touchdown against Duquesne on November 15, 1947 (ironically the same date as Miller’s punt return) and had a 90-yard punt return against NC State on October 2, 1948. That punt return by Gage was Clemson’s only score in a 6-0 victory. Clemson Defense Has Had Standout Performances Clemson has had some outstanding performances on defense this season. Overall, Clemson ranks in the top 25 in the nation in pass defense and has improved its total defense by 26 yards per game over last year. Here are some quick facts on the defense’s accomplishments this year: *Held Florida State to 11 yards rushing, fewest rushing yards in a game since Bobby Bowden became head coach in 1976. *Held Florida State to just 10 points, fewest in a game all season. *Held NC State to 283 yards of total offense, fewest for the ACC’s total offense leader all season. *Held Phillip Rivers to just 213 yards passing, fewest Rivers has thrown for in a game all year. *Held Duke to 174 yards of total offense, fewest by the Blue Devils all year and the best total defense for any ACC team against another conference opponent all year. *Six of the eight ACC teams failed to reach their season average in terms of total offense and scoring offense against the Clemson defense this year. *Clemson has given up just two touchdown passes over the last four games. *Clemson’s defense has not allowed a point after a Clemson turnover in eight of the 11 games so far this season. Hamilton Scores Two Touchdowns in 14 Seconds Clemson wide receiver Derrick Hamilton has the ability to change the course of a game very quickly. He showed that at a record rate in the victory over Duke when he scored two touchdowns just 14 seconds apart in the first quarter. Hamilton scored on a 31-yard scoring pass from quarterback Charlie Whitehurst with 5:57 left in the first period to give Clemson a 7-0 lead. Duke then lost a fumble on the ensuing kickoff. On Clemson’s first play after the fumble, Whitehurst connected with Hamilton on a shovel pass for a 25-yard touchdown at the 5:43 mark of the period. A review of the available scoring summaries in the Clemson sports information office shows that this is the shortest interval between offensive touchdowns by the same player in Clemson history. The previous best on record was a one-minute interval by Terry Allen in a game at Maryland in 1988. Two different Clemson players (Homer Jordan and Chuck McSwain) scored 27 seconds apart in the third period of Clemson’s 82-24 victory over Wake Forest in 1981. Last Trip to ColumbiaSouth Carolina 20, Clemson 15 In front of a record crowd of over 85,000 fans, South Carolina snapped a four-game losing skid against archrival Clemson with a 20-15 victory at Williams-Bryce Stadium in Colombia. The win was South Carolina’s first over Clemson since 1996 and its first victory at home against the Tigers since 1987. Woody Dantzler completed 15 of his 29 passes for 204 yards to go along with two touchdowns. Dantzler also rushed for 102 yards on 20 carries. Clemson’s defeat marked just the second time in Dantzler’s career that he had rushed for 100 yards and tallied 300 yards of total offense in a single game, in a Tiger loss. The key play of the game came early in the fourth quarter. From the one-yard line, backup quarterback Corey Jenkins carried the ball across the goal line on fourth-and-goal to give South Carolina a 20-9 lead, which the Gamecocks never surrendered. Cornerback Sheldon Brown kept South Carolina in the game midway through the first half, when on fourth-and-one from the Carolina 43 yard-line, trailing 6-0, Brown intercepted a Dantzler pass intended for Travis Zachery that would have resulted in a Tiger touchdown. Brown intercepted another Dantzler pass at the Carolina goal line as the first half expired, ending another Clemson scoring threat. Brown had not had an interception all year heading into the contest. South Carolina’s offense held the ball over 21 minutes and engineered a pair of long (in terms of time) scoring drives that made the difference in the game. Jenkins’ one-yard run in the fourth quarter finished off a drive that had lasted 14 plays and 80 yards, and Daniel Weaver’s 42-yard field goal in the third quarter capped off a seven-play, 40-yard drive that took over seven minutes off the clock. Clemson had just nine yards and six plays in the third period. Clemson scored first when Dantzler connected with Airese Currie for a 54-yard touchdown reception, but Aaron Hunt’s consecutive extra point attempts made was snapped at 44 after he missed a 35-yard extra point attempt. Clemson’s Akil Smith was penalized 15 yards for excessive celebration. After Weaver and Hunt exchanged field goals of 29 and 24, respectively, Derek Watson gave the Gamecocks the lead for the first time with a six-yard touchdown run with 2:26 remaining before halftime. The ensuing Tiger drive lasted 10 plays and covered 40 yards, but was cut short by Brown’s second interception of the game. Carolina’s opening second-half drive lasted 13 plays while covering 40 yards; most importantly, however, 12 of the 13 plays were running plays, and the Gamecocks managed to keep the ball for 7:50 before the Tiger defense held them to a field goal. Phil Petty and Corey Jenkins teamed up to lead the South Carolina drive down the field, which covered 80 yards on 14 plays. Petty completed all four of his passes for 39 yards and added the key seven-yard rush to set up Jenkins’ one-yard carry on fourth down. The Carolina scoring drive would prove to be the difference in the game. Dantzler’s 11-yard touchdown pass to Derrick Hamilton with 2:38 remaining in regulation provided a spark for the Tiger defense. Clemson got the ball back with 17 seconds left, but a long pass for Derrick Hamilton and Currie fell incomplete and the game ended. Clemson Now Bowl Eligible Clemson has a 7-4 record and became bowl eligible with its 26-10 win over Florida State on November 8. Clemson now has a 7-4 record and hopes to reach eight wins in the regular season for the first time since 2000. This is the 16th time in the last 19 years Clemson has been eligible for a bowl game. It is the fifth straight year Clemson has been eligible under Head Coach Tommy Bowden. If the Tigers advance to a bowl, it would be the first time since the 1987-91 era that Clemson has gone to a bowl game at least five years in a row. Bowden is already the first Clemson coach in history to take a team to a bowl game in each of his first four years with the program, one of just three ACC coaches to do it. The others are Lou Holtz (NC State) and Bobby Ross (Maryland). If Clemson goes to a bowl game this year Bowden will become the first coach in ACC history to take a team to a bowl game in each of his first five years with an ACC program. Clemson is eligible for selection to the Gator Bowl (Jan. 1), the Peach Bowl (Jan. 2), the Tangerine Bowl (Dec. 22), the Continental Tire Bowl in Charlotte (Dec. 27) or the Humitarian Bowl (Jan. 3). Florida State is the ACC champion and will go to a BCS bowl.Clemson Veterans versus South Carolina Eric Coleman (DT) – Had two tackles in 21 snaps versus the Gamecocks last year; had a tackle for loss in 29 snaps during the 2001 game. Airese Currie (WR) – Had two catches for 29 yards last season; in 2001 game he had three catches for 65 yards, including a 54-yard touchdown strike from Woodrow Dantzler. Maurice Fountain (DE) – Has five tackles in 40 career snaps against the Gamecocks. Toure Francis (CB) – Had four tackles and an interception in 2001 contest. Jamaal Fudge (ROV) – Had four tackles and played 11 defensive snaps in 2002. Derrick Hamilton (WR) – Had seven catches for 76 yards in 2002 game; had two catches for 20 yards in 2001 with a touchdown catch included. William Henry (OT) – Played all 79 snaps and graded 82 percent in 2002 win. LeRoy Hill (LB) – Has just one career tackle in three snaps against the Gamecocks. Aaron Hunt’s (PK) – Has hit 6-7 field goals in his career against South Carolina, including 2000 when he hit the game-winning kick in the final three seconds. Chad Jasmin (RB) – Had four carries for 14 yards in 2002 game; played 11 snaps in 2001 game; had a special teams tackle in 2000 contest. Cedric Johnson (OG) – Graded at 87 percent to lead the Tiger offensive line in 2002. Yusef Kelly (RB) – Had 10 carries for 64 yards, including 48 on the Tigers’ game-clinching drive, in 2002; did not play in 2000 game. John Leake (LB) – Had 11 tackles in the 2002 game and 17 in 2001, including one for loss. Justin Miller (CB) – Had three tackles and a kickoff return for 32 yards in 2002 game. DeJuan Polk (DT) – Had five tackles in 2001 game; did not make a tackle last season against USC. Travis Pugh (FS) – Played just three snaps at safety last season versus USC. Eric Sampson (WHIP) – Has 11 tackles in two games versus the Gamecocks. Tommy Sharpe ( C) – Had 12 knockdown blocks against South Carolina last season. Khaleed Vaughn (DE) – Had seven tackles and two pressures last season; had career-high 10 tackles and one for loss in 2001 game; played 19 snaps in 2000. Gregory Walker (OT) – Had 11 knockdown blocks in 2002 game. Donnell Washington (DT) – Had just one tackle last season but had seven as a freshman in the 2001 contest. Charlie Whitehurst (QB) – Was solid in 2002 game with 27-for-38 completions for 287 yards; scored a game-tying touchdown in the second half on an elusive 11-yard scamper. Kevin Youngblood (WR) – Had three catches for 35 yards last season; had two catches for 42 yards as a freshman in 2000.